Duck Hole is a remote and wild place. The closest road or trailhead is at Upper Works, 7 miles away. It has long been a favorite destination on the Northville Placid trail. Once it was the site of a beautiful pond; formed by a manmade dam. This changed forever with Hurricane Irene in August 2011. The dam was destroyed by the hurricane and Duck Hole drained. At this point in time, it is a wonderful meadow and stream. There used to be a DEC Ranger Station at Duck Hole, along with 2 lean-tos. The lean-tos still exist, although one is in need of some repairs. Today Leesa and I went to visit Duck Hole from Upper Works. It was a 14 mile round trip hike, but it was a nice fall day and we wanted to see the post-Irene Duck Hole. We started from Upper Works at 9:50. It was 42 degrees and sunny. The parking lot was mostly full, but a couple of spaces remained. 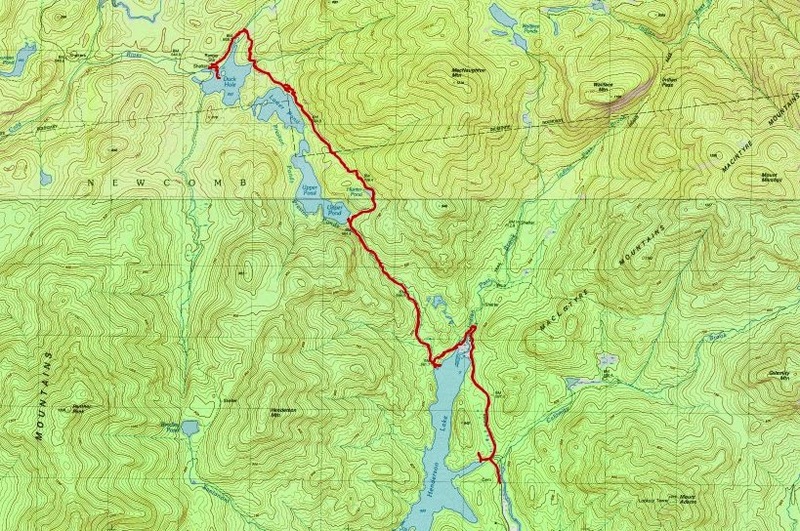 Several groups had signed the register, but all were headed for Mount Marshall or Cliff and Redfield, except one who had signed in just before us with a destination of Indian Pass. We stopped at Henderson Dam to revisit the lake from that viewpoint. Soon afterwards, we caught up with the couple headed for Indian Pass. We passed them and then came to the fork in the trail where we proceeded to bear left to head for Duck Hole. We never saw another person all day. I believe this is now State Land. In any case, the sign is getting swallowed up. The Henderson Lake lean-to was unoccupied. It was nice to see the area very clean. We went to the water's edge and Rev went in the water to get a drink. Next destination was Upper Preston Pond. I had XC skied to this lake on my last visit. As we followed the trail up and around the north side of Upper Preston/Hunter Pond/Lower Preston, we began to see artifacts of an earlier time; old parts of vehicles, machinery, cooking ware. Before the area was designated as wilderness, activities had obviously taken place in these woods that involved equipment that would no longer be allowed. Our imaginations conjured up images of what the area was like in those days. As we approached the NE side of Lower Preston Pond, we entered an area where beavers had flooded out the trail. No obvious work around was obvious. We bushwhacked around the wet area and made our way back to the trail. This didn't take more than 15 minutes, but it would probably be enough to convince many people to turn around. Be forewarned if you don't like to bushwhack. At last, we made it to the east side of Duck Hole. The change from pre-Hurricane Irene is instantly obvious. There was no water form this viewpoint! We continued to follow the trail around the north side, to the NE side where the 2 lean-tos are located. Near the lean-tos, is a trail register sign-in and some directional signs. The distance to Upper Works had been covered up. I wondered if that was because of the portion of trail that was no longer available. At the lean-tos we ate a late lunch and soaked up the early afternoon sun. It was great to have the area to ourselves. Leesa explored around the old dam a little bit and Rev and I wandered out into the new meadow. It's really neat just to walk around the area. We looked around for about 30 minutes and then it was time to go. It was 2:30 and the sun was sinking fast in the Fall sky. We pretty much just hiked straight up with no stops on the way back. I expected we would see somebody since it was a holiday weekend, but we were content to have our own little quiet section of woods for the day. We got back to the car about 6 PM and were able to get back to the Northway before dark. Great hike on a picture-perfect fall day! Lovely photos! 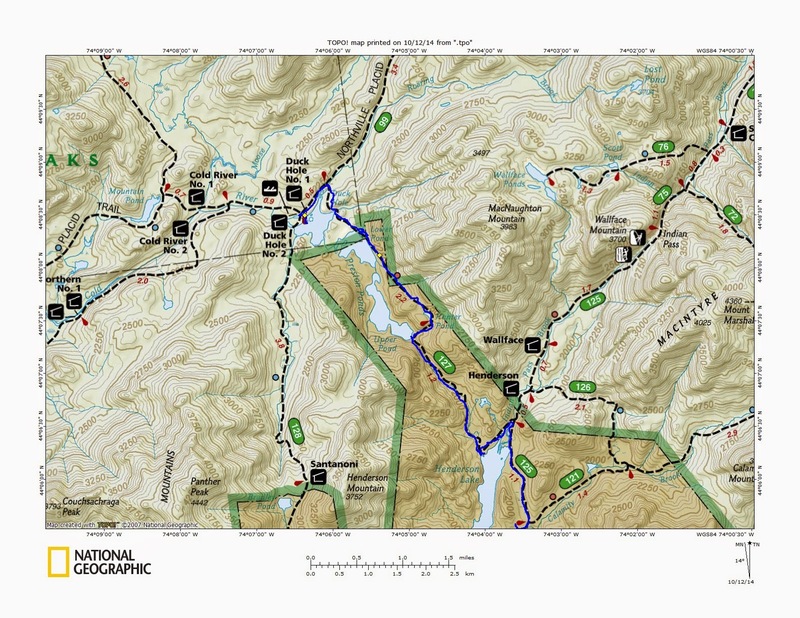 Yeh, the only time I was at Duck Hole was pre-Irene (Sept 2009), doing a thru-hike on the NPT.